The National Geospatial-Intelligence Agency, or one of its many predecessors, has been in St. Louis for more than 70 years and has about 3,000 employees in the city. 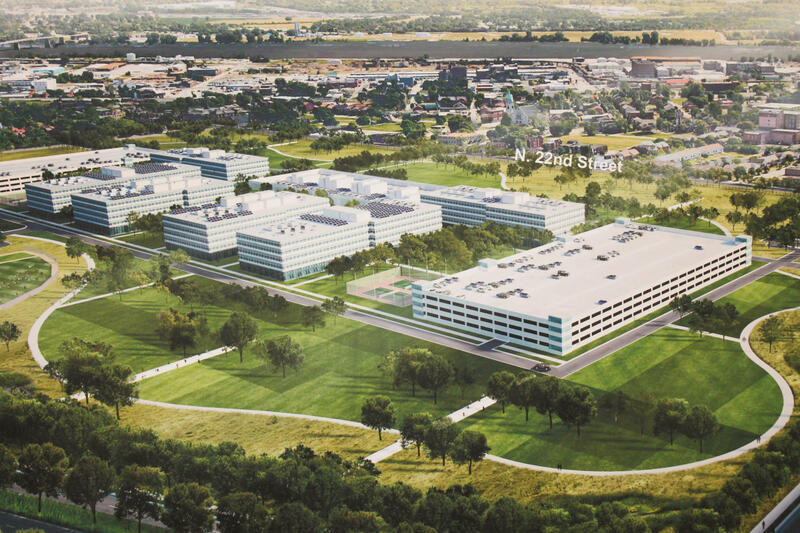 Earlier this summer the federal spy agency announced it had chosen a north St. Louis site for its new $1.75 billion campus. Listen to the conversation with NGA director Robert Cardillo here. 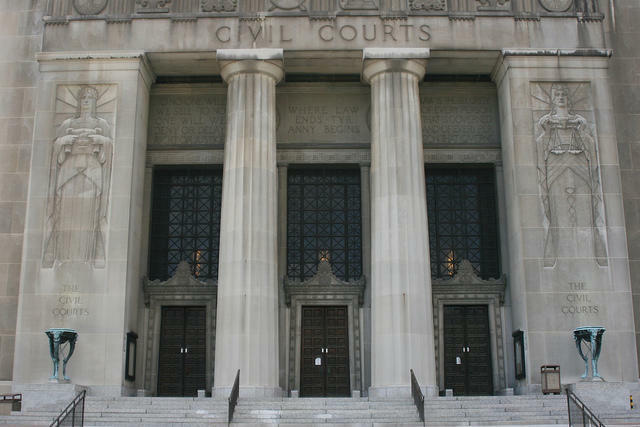 When you’re outside government circles, how do you explain what the NGA does? I call it my Rotary Club speech on why the United States invests in this thing we call the National Geospatial-Intelligence Agency. Our statement about what we do is nine words: know the Earth, show the way, understand the world. 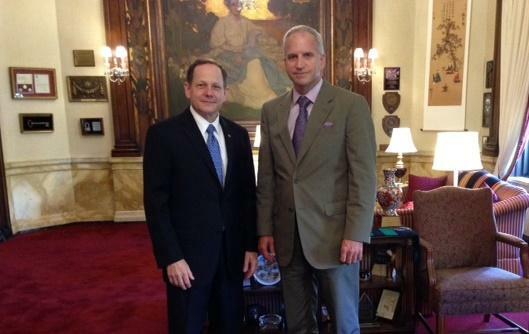 St. Louis Mayor Francis Slay and NGA director Robert Cardillo in the mayor's office. By knowing the Earth we do the mapping and charting and the geodesy. We understand the planet. We show the way so that those who depend upon us can safely navigate. It’s mostly military, but all airlines use our products and services. Understanding the world is our intelligence business and so this is trying to determine what is the meaning of those things we’re seeing on the Earth and near the Earth. Those three things sum up what we do. There is a fear in the community where you're locating that there is going to be a moat around the facility. How will you connect with the neighborhood? We’ll obviously build upon the city’s process and their Project Connect. We’ve been involved from the beginning and we intend to stay involved. One of the ways we’ve connected in our Washington headquarters that opened about five years ago is we’ve done a great deal of academic outreach and of course we’re always dealing with universities because that’s our recruiting pool for incoming teammates. But we’ve been at the elementary, middle school and high school level because we reflect the general challenge in this country that we don’t have enough people taking science, technology, engineering and math courses. So we go out and incentivize and even create programs in which high schools can come in our space in Springfield, Virginia, interact with our experts and even present their projects. Obviously it’s in our interest if we can instill an enthusiasm for our profession. But it also brings us together with those we live with, because those students are the sons and daughters of our kids and those families are those we live next to. We fully intend to do the same thing with our campus in north St. Louis. Would it be overstating it to say that you’d like to see a pipeline from local schools to the NGA? So I’ll take pipeline, I’ll take bridge, I’ll take highway. I’ll take any mode of conveyance we can think of. But seriously, as I’ve looked at early design ideas about what to do with the property there are schools nearby that I would not mind seeing, literally, build a walkway over Cass or Jefferson so that we’re that connected. We have to have a visitor’s center, we have to have a check-in facility, so why not make part of that educational? Why not make that maybe a joint project with the city or local school for shared space? I could bring in experts who could take their professional experience and have them interact with students who are learning about the profession. I’d be open to that and more. I have a distinct responsibility. I’m a combat support agency. I work in the Department of Defense. I have a national security mission, so that’s my primary goal. It is in my interest that wherever I operate, I operate in an environment that’s vibrant, diverse and interactive if for nothing else, because that reflects the world I must understand. So if I were to somehow recruit a workforce that only reflected one part of our community, I wouldn’t be doing that first part of my job. I couldn’t because I’d be myopic; I’d have blind spots. I need to reflect the diversity of the mission I’m tasked with. To your question about how would I make sure they’re not disadvantaged, I’m really counting on my partnership with the city here. Again, I’ve got a responsibility on that plot of land to do what I can to make sure I can execute my mission. I do think that our mission overlaps, and I’ll be working arm and arm with the city. I’ve heard that the NGA won’t need all 99 acres of the site. Is that the case and how many acres are you going to use and what will you do with the rest? I need 99 acres. That’s what I went to Congress and requested support for and we have support for that. Having said that, as we’ve looked at some early designs it may not be necessary, and I hope it’s not, that we have 99 acres with a large fence or wall that covers the entire perimeter. We would hope that there would be opportunities for some shared use ground, whether that’s recreational facility or playground or park or just a walkway so that, again, we don’t want to be an island. So I can imagine pathways, gardens that would perhaps ease the transition between the part I must secure, because that’s my job, and the neighborhood we’re going to live in. I need to be clear, I absolutely need 99, but I think the way we site the facility should give us some options to make it more fluid and more easily connected to the neighborhood. Even though the grounds are owned by the U.S. Air Force, do you know what will become of the old NGA facility? I honestly don’t know. It’s a historic property, so I’d be surprised if the Air Force was able to do anything other than protect, maintain, and preserve. It won’t be my call, but I would expect at least a portion of it will have to be preserved given its historic nature.